Shofar Ribbon Tallit Set -Black is a fabulous design weaving a shofar ribbon across the black bands. This Shofar Ribbon tallit is available in Black/Gold or Black/Silver. 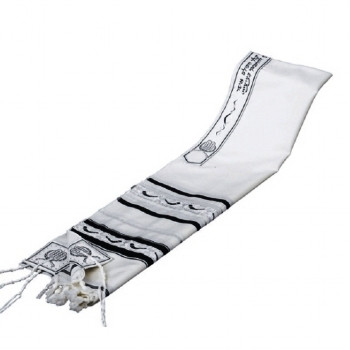 100% Wool Kosher Talis made in Israel, meeting the strictest standards of Jewish Law. Featuring the Shofar (Ram’s Horn) blown on the high holidays and available in an array of sizes with optional personalization. A service we provide exclusively. Posted in Classic Tallit and tagged Shofar Ribbon Tallit Set -Black.